The final point race of the 2015 NASTE season was an interesting event. Twelve racers showed up, some of them came to race. Rico prepared Scalextric Ferrari’s for the first round that were fast and fun. Lighted even. And for that second round Rico pulled out our favorite Ninco wonders – the Fickle FIATS of Fate. Thanks to Perry they will now be known as the Flying Fickle FIATS of Fate. Can you say “lift-off”? Not to be outdone, June performed a perfect horizontal 360. That she failed to also “stick it” was deemed irrelevant. Charging to an impressive win overall in the NASTE Challenge class John Fisher put a lap and a half on the field with Mitch Brooks second and Al Christensen in third. In the expert Division Rico Locati gave us all a good whuppin’. Monte Saager finished second with Terry Abbott third. Thanks to Kelly for providing a great feast despite being in considerable pain and all the others that contributed. It wouldn’t be the same without you. 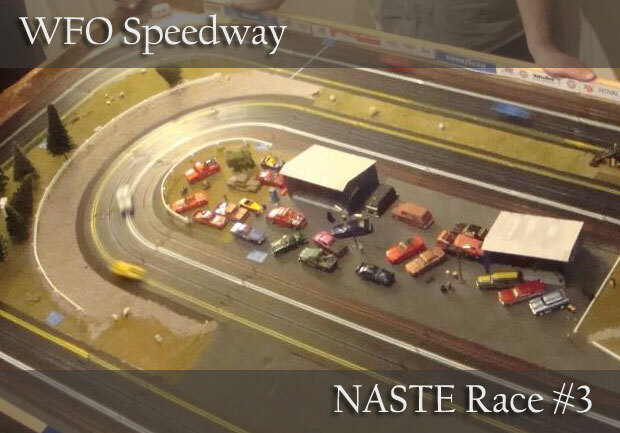 Hosting an IROC style race on a digital track would be a daunting task, even for a veteran slot car track enthusiast. Especially on the lucky 13th event of the season! But Monte "The Big Smooth" pulled it off in typical Big Smooth style. This was by far the best digital race I have attended. Monte has his new Jacquelin Park Speedway dialed in. Monte has not only reconfigured the track, but has switched from an SCX system to Carrera. The last race on this new track showed improvements over the old SCX track, but now with the addition of the RamJet controllers he has an excellent race venue. The improvement over the Carrera controllers with the RamJet controllers is significant to say the least! Another significant improvement was the way the refueling was accomplished. The racers of the evening were Can Am cars – a Porsche 917/30, a McLaren M20 and two Lola T222’s. Race preparation consisted of removing the traction magnets and replacing the stock rear tires with Paul Gage Urethanes. The racing consisted of an elimination style race format with a full set of 25 lap heat races to establish grid positions. After the positions had been determined the elimination races were held: 50 laps with re-fuel. The racing between competitors was fierce. Surprisingly it was also very clean racing with few nerfs and punts. Taking top honors in the NASTE challenge division was Mitch Brooks with Dennis Hart in second and Al Christensen in third. 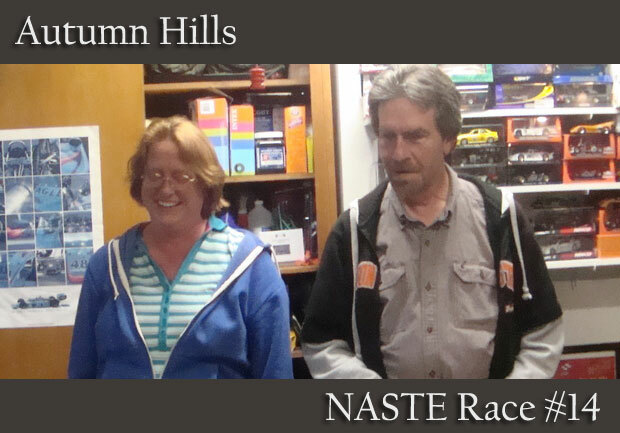 For the experts Bill Bostic took the win with Monte Saager in second inches ahead of Tracy Flood in third. A big thank you goes out to Monte for not only introducing us to the digital slot car world, but for taking the chance to actually put on a race where the probability for "issues" is high. And thank you Victoria for not only providing us with a great meal, but for supporting Monte as we all know you do in all of his slot car endeavors! 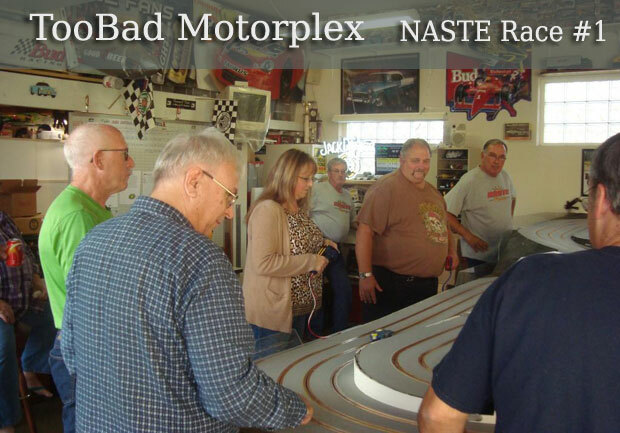 A great group of twenty-seven racers attended the 12th NASTE race at Bill Bostic’s Too Bad Motorplex in Fairview this past Sunday. The car of the afternoon – Parma Womps – 1:24 scale. VW Bugs to be specific. Harkening all the way back to the early days of NASTE – a Dave Smith design. Now you’d think with all those bugs loose that someone was going to get slugged but the only violence in attendance was occurring on the track. The little slug-a-bugs buzzed around the circuit like a hoard of angry bees with each driver pushing to the limit. Occasionally one of the bees would get sent off with a little slap. That only seemed to make them angrier. Despite such raucous behavior no bees were damaged - and no drivers were slugged. When two sets of heats finally concluded Goose Gossett slipped by Flyin’ Bryan Trachsel for the win in the Expert division with Rico Locati and Terry Abbot finishing tied for third. Jeff Fields took the top spot in the NASTE Challenge division with Thomas ‘the Chizzle’ Flood second and Tyler Petrequin in third. Thanks to Bill for hosting and all the others that contributed to a splendid afternoon. We had big fun with the little cars at Hammer Time Speedway. As usual Terry Abbott prepared some exciting Aurora Thunderjet cars for us to race. However this time he went over-the-top! Yes, something even more outrageous than the Space-Jets, or even the Monster-Jets! But we'll get to that in a minute. For the first round of racing Terry had four equally prepared muscle cars on the start line. Two Camaros and two Dodge Challengers. Bodies were of the Johnny Lightning variety. This first set of cars were fast and handled very well. After racing a full set of three minute heats everyone was settling into the T-Jet pace. Then he sprung it on us! What the hell are those was the cry from the crowd? All I can say is; have you ever seen HO scale Isettas? Yes, BMW Isettas were the cars of choice for the second round. Now these things may look like they might handle bad. Well I can tell you from experience, they do! But, what they lacked in handling they more than made up for in the fun department! We raced these little Isettas for one minute heats. I think that's all Terry thought we could stand. Finally we were at the final round of racing. Out came the Willys dirt track cars. Now these are a crowd favorite. The fender-less Willys are fast and handle great! Quite a difference from the little evil Isettas! After the final checkered flag had dropped Dana Denton had finished in first place in the NASTE Challenge followed by Jeff Fields in second and Todd Flood in third. Bill Bostic led the field in the Expert division followed by Terry Abbott in second and Dave Smith in third. For reference, the Isetta bodies are made by BRP. They really are nicely made bodies with excellent detail. When set up as Terry built them they actually handle well, not too bad. But they are a LOT of fun! In fact I will go as far to say the Isettas were my favorite! A big thanks to Terry for all the great race cars and track fun, and to Dorothy for all the great food and homemade candies! 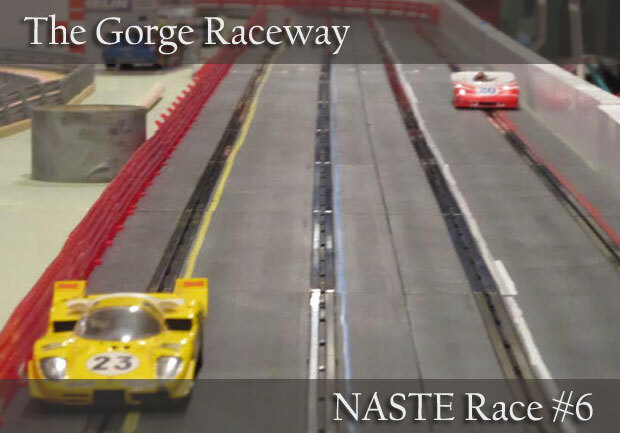 NASTE racers returned to The Gorge for the 10th race of the 2015 season. With 18 racers in attendance we attacked the course with a vengeance! For the evening festivities a set of somewhat equally prepared SCX NASCARs with traction magnets were offered up. And they happily ripped down the long front straight and through the first section of fast flowing curves, only to be confronted by the difficult and challenging infield section of tight corners and short straights. That’s when the real fun started! Crash, bash, moan and groan. And so it went, drivers would fly around half the track and then struggle to get the long NASCAR’s through the tight spots. Some made it, some cried rider, some just cried. Yes, the Gorge is a challenging Scalextric track to say the least. Coming out on top in the NASTE Challenge division was Jeff Fields with Mitch Brooks taking second and Tyler Petrequin just edging out dad Perry for third. In the Experts division home town hero Bob Nakamura finally got past early leader Monte Saager – well they were his cars after all – to bring home the victory. Also coming up big in the second set was Bryan Trachsel finishing in second while the Big Smooth stumbled to a third place finish. As always, the food was second to none. Thanks to all that contributed, it was a fantastic night. An exceptional crowd of twenty-one racers came out to race at Bryan & Sherry’s WFO Speedway for the 9th race of the NASTE season. And the action was, well frankly wild, frantic, and outrageous! Bryan had two sets of four T-jets for us to race. The first set of cars were the ’55 Chevys. The ’55 s are my personal favorites, they maintain that NASTE heritage. The racing in the first round with the ‘55s was exciting to say the least. The cars performed flawlessly until the last couple of heats. One of the cars experienced a loose rear wheel. Since loose wheels only stay loose for so long it was soon to be so long wheel. After a little time out for some automotive repairs the car was back and running like never before. , and not too long after lost it entirely. Leading after round one was Dana Denton with Jeff Fields in second and John Fisher in third in the Challenge Race, while Terry Abbott held a slim lead over Bryan Trachsel with Tracy Flood third in the Expert Division. With round two we encountered the second set of cars, the Jalopy’s! Bryan displayed some apprehension about racing these beauties after the problems encountered in the first round with the ‘55s. Traditionally the Jalopy’s tend to be somewhat more fragile and finicky than other T-jet cars. However much to everyone’s delight the Jalopy’s not only handled extremely well, they worked perfectly. After two rounds of tight, competitive racing it was Dana Denton leading the field in the Challenge Division with John Fisher second and Todd Flood climbing into third. Bryan Trachsel ran a great second set to slip past Terry Abbott into first place with Tracy Flood taking third. Thanks to Bryan and Sherry for hosting and feeding us. Dorothy once again offered some fabulous looking deserts. The ladies played a few rounds of team Upwords. It was a great night. A new track, a new challenge, and another exciting evening of racing! As you’ve probably all heard by now Monte and Victoria replaced their SCX Digital track with a new Carrera Digital track and it was a hit. The new track is smooth as silk and the layout easy enough that after a few minutes most were driving like experts. The Carrera Can Am cars Monte had prepared by removing the magnets and adding Paul Gage tires performed flawlessly, the system operated without a hitch. The drivers? Well, it is a NASTE event after all. Once the sixteen racers in attendance had some practice time, we let the ladies – and Thomas – divide up the racers into four teams and it was Enduro time. During the next two hours teams raced lap after furious lap while taking time to come in for the occasional pit stop and refuel. Ok, they were a little more than occasional… We’ll work on that. Regardless, by the conclusion the margin between the top three teams was a mere four laps for an amazingly close finish! Let’s not forget the food. Plenty of it for anyone with time to eat. There was pizza, vegetarian pizza, chicken, and assorted snacks, as well as Dorothy’s famous candies on hand. By the end of the evening smiles were out everywhere and all seemed to have had a pretty good time. And that’s about all you can hope for. 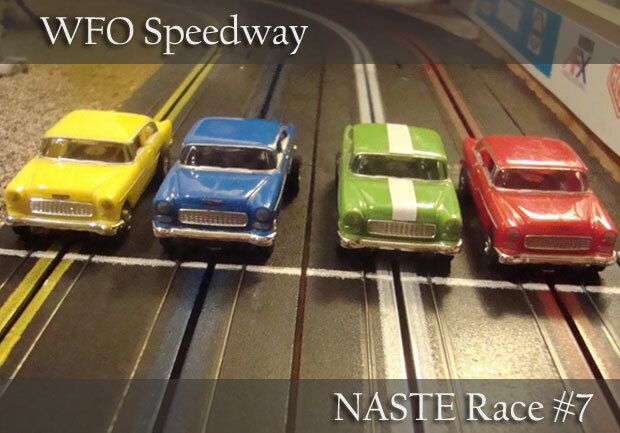 The seventh race of the NASTE 2015 Point Series Championship, HO style, was held at WFO Speedway this past Saturday. 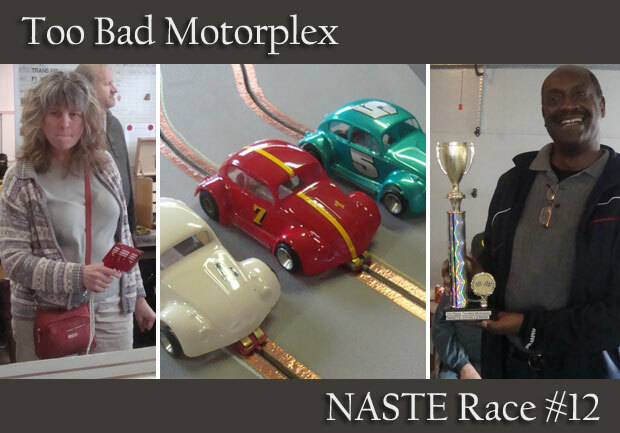 Sixteen racers evenly divided into the expert division and the NASTE Challenge division were in attendance. The racing was intense and very close! There were some spectacular crashes in both divisions, pretty much equally divided between the AC Cobras raced in the first round, and the '55 Chevy's raced in the second round. The "Goose" and Thomas Flood both showed amazing consistency by running the same exact number of laps in each round. Jeff Wilson posted his first win in the NASTE Challenge besting Dana Denton by a single lap with Thomas Flood in third. New racer Jeff Fields finished fourth in the NASTE Challenge, an excellent finish especially considering this was his first time on the track. Congratulations Jeff and welcome! In the expert division it’s still the same old story, a fight for love and glory. A case of do or die… As cars go by. And in this case, once again, Flyin' Bryan was the man followed by Terry Abbott in second with Tracy Flood taking third. Congrats to the winners, and thanks to Bryan and Sherry for hosting another terrific event! A new track, a new challenge, what an exciting evening of racing! 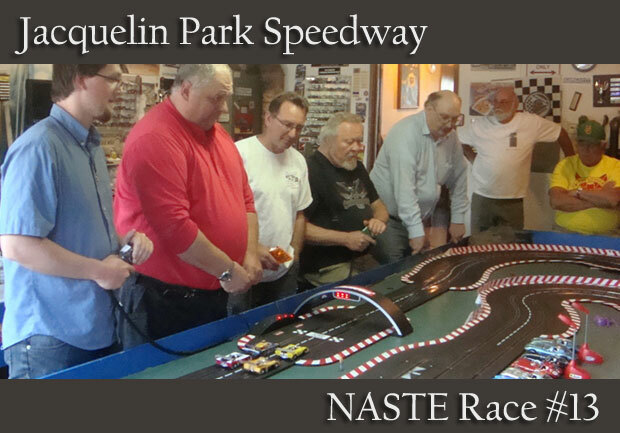 Bob Nakamura provided the NASTE racers with the honor of the first official race on his big Scalextric four lane track. 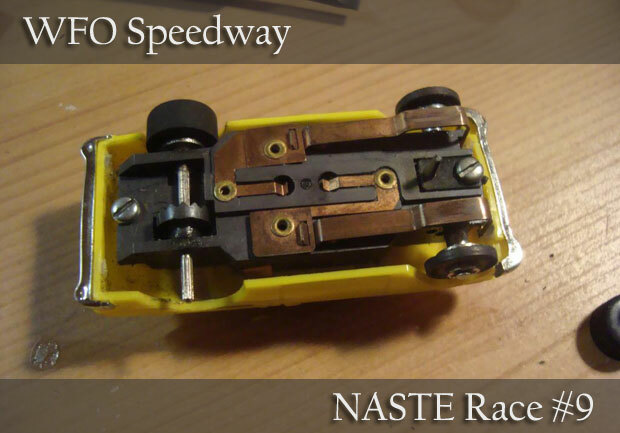 And true to NASTE racing, we broke that baby in right! 22 racers put the track and computer system to the test. To Bob’s credit we did not experience one problem with the track. The night’s racing consisted of two rounds of three minute heats. Fly Classics were the cars of choice for the IROC style format. Racers found the car and track combination quite challenging, but all adapted quickly and the racing was actually quite close. In the Challenge Race Thomas Flood posted his third consecutive win, and fourth of the season. John Fisher was a few tenths behind in second with Perry Petrequin third, his best finish to date. The Challenge racers made up over half of the field of racers for this event, and we even saw some new faces including Eugene Jung who traveled all the way from Southern California to race with us. The expert division was hotly contested. Initially it looked to be Flyin’ Bryan’s night, but after intense battling Rico Locati pulled out the win with Bryan in second and Tracy Flood taking third. And there was food! There was pizza, meat balls, chicken, and assorted snacks, as well as Dorothy’s famous candies on hand. A great big thanks to Bob and his wife for a truly enjoyable evening and some great racing! Sunday December 7th was the day for racing in the hills. Rico and Kelly Locati hosted the fifth race in the NASTE 2015 Point Series Championship. Racing at the Hills is a special treat as Kelly lays out a food spread equivalent to anything you might see at a Greek wedding! After we had all filled our stomachs we got serious about racing. Ok, maybe semi-serious. Rico had brought out some old favorites for us to maneuver around the tight and twisty Autumn Hills course. For the first round of two minute heats we raced Nino Mercedes. The Mercedes were somewhat loose in the traction department, so fast laps required a fair amount of judicious applied throttle! Even at that the racing was extremely close, with Rico taking the overall lead after the first round. The second round flag dropped on the 4F cars (Famous Fickle Fiats of Fate). The 4Fs are notoriously famous at Autumn Hills for providing an exceptional challenge and extreme fun! For this race the little Fiats were unusually well behaved and rewarded it’s admirers with quick lap times. At the end of the day it was Monte Saager in the number one spot with the overall win. Thomas Flood backed up his last NASTE Challenge win with another win here at Autumn Hills. Thomas is on a tear this season, so far winning every Challenge race he has attended! Some of the race highlights included Tracy Flood’s smooth and consistent driving which got him a third place finish overall. Dana Denton a long time racer friend from the eighties made it out to see what the NASTE thing was all about. Victoria Saager had a strong finish with the Fickle Fiats showing her skill on the Autumn Hills layout. And John Fisher had an excellent run with the Mercedes. All in all, it was a great day of racing in the hills! 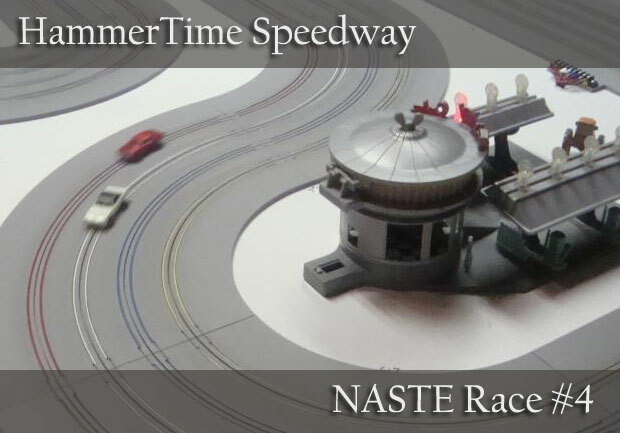 The fourth race in the NASTE 2015 point series was held at Dorothy and Terry’s HammerTime Speedway. And for this night we had not only two sets of Terry’s HO demons but an additional set of cars from Richard Phillis, better known as the master of the Ferndale Fray. The first set featured the cars from Richard which proved quick and smooth. For the NASTE Challenge Thomas Flood charged out to an early lead and took first followed by hometown heroes Amanda Abbott and Nick Snowhill. For the experts it was Flyin’ Bryan Trachsel taking the win followed closely by Richard “hey, those are my cars!” Phillis and Terry Abbott. For the second set Terry brought out the off-roaders. Slippery and tippery! Showing skills like no other Victoria Saager dominated the Challenge division with Perry Petrequin in second followed by Thomas Flood. Once again it was Flyin Bryan Trachsel taking the win in the expert division with Terry Abbott in second and Bill Bostic clawing his way into third. For the final round, it was Space Racers! Weird and fun. Blasting off into the black was Thomas Flood followed by the mercurial brother Todd Flood with Victoria Saager touching down in third. Leading the space race for the experts was Terry “The Mailman” Abbott with Bill Bostic second and Richard “not my cars” Phillis in third. Thanks to Terry and Dorothy for hosting this round and Richard (California) and Ruben (Canada) for making the trip to join us. 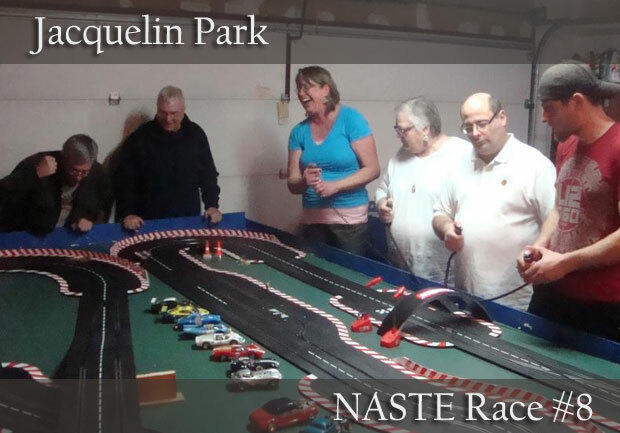 The third race in the NASTE 2015 point series was held at Bryan & Sherry Trachsel’s WFO Speedway. WFO is a very challenging but fast HO track. Bryan had prepared two sets of cars for the IROC style race, and the NASTE Full Monte race format was used for this race. The NASTE Challenge racers were the first to hit the track. The racing was fast and close. Russell Flood drove consistently making very few mistakes, which resulted in wins for both NASTE Challenge rounds. Mitch Brooks and Victoria Saager posted second place finishes. In the first round of racing for the expert group it became obvious Bryan and Terry were the guys to beat. When it comes to T-Jet style, pancake motored cars Bryan and Terry are always at the front of the pack! After the checkered flags Bryan had posted two wins, with Terry in second place for both rounds. A great big thanks goes out to Bryan and Sherry for hosting this race. It was a last minute call with little time for preparation. With that said, Bryan worked the bugs out of a new electronic timing and lap counting system and got the track and cars race ready. The race went off without a hitch, well except for those caused by the racers themselves! 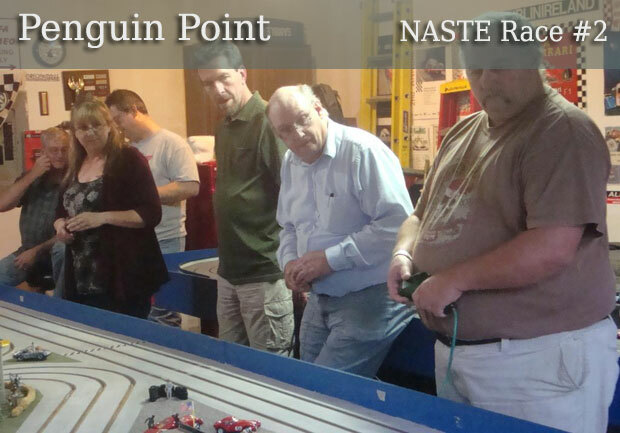 Monte & Victoria's Penguin Point hosted the second round of the NASTE 2015 racing season. We had a very good turnout with 17 racers showing up to compete on the very tight and technically challenging course. Penguin Point is one of the toughest tracks on the NASTE circuit. This track rewards smooth and consistent driving. And if the first two races of the NASTE 2015 season are any indication it is going to be a tightly contested championship! The second race this season at Penguin Point was as close as it gets. Thomas Flood is starting off his season in the NASTE Challenge with a win at Penguin Point putting him neck and neck with the winner of the last Challenge race Mitch Brooks. In the expert division there have been two different racers posting wins, both winning by the narrowest of margins. It is clear just from the first two races that all of the NASTE racers have improved their skills over last year. For the first race Monte set out the Cartrix Grand Prix Legends cars. Beautiful cars, simple in execution. Leading the field in the NASTE Challenge group was Thomas Flood with a half-lap lead over Mitch Brooks, with John Fisher almost another lap back. While in thee Experts division Monte Saager just slipped past Bill Bostic to hold a one-tenth lap lead with Terry Abbott another two-tenths back. In fact four racers were on the same lap only six-tenths apart. Happy to put the pedal to the metal racers improved their lap totals considerably. In the NASTE Challenge division Thomas Flood once again found the fast way around the track barely holding off the hard charge of Victoria Saager to take first place by two-tenths with David Harburg another two-tenths back in third. Pulling out all the stops in the Expert division, Monte Saager put another six-tenths on the field with Bill Bostic in second and Terry Abbott again taking third. And once again racing was close with five drivers within two laps. When both rounds were added together Thomas Flood claimed top honors in the NASTE Challenge with Mitch Brooks finishing second and John Fisher taking third. In the Expert division Monte Saager managed to hold serve with Bill Bostic second and Terry Abbott third. Thanks to Monte & Victoria for the most excellent pizzas and snacks! And of course a thank you goes out to Dorothy who always provides us with some of the best homemade candies on the planet! The season opener for the NASTE 2015 Point Series Championship was held at TooBad Motorplex in Fairview. The doors opened early, right after a breakfast get together at the local saloon, for a full day off racing. The day started with a vintage F1 race, followed by a classic sports car race. 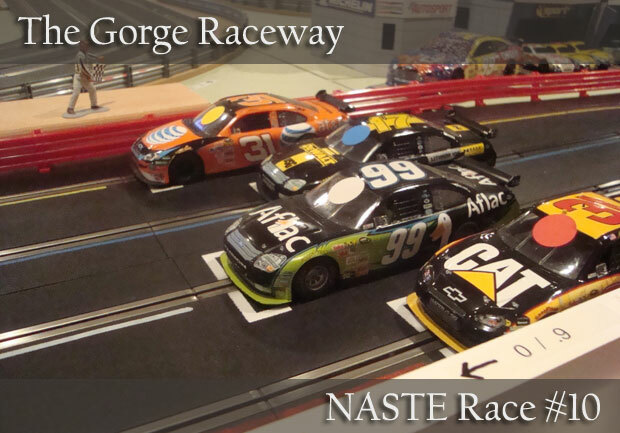 Both races consisted of cars configured and set up for the NASTE Odd Thursday Night races. There was lots of time for practice and just playing around with whatever racers brought out. Somewhere around lunch time a few of us went up the street to a local diner for some lunch. 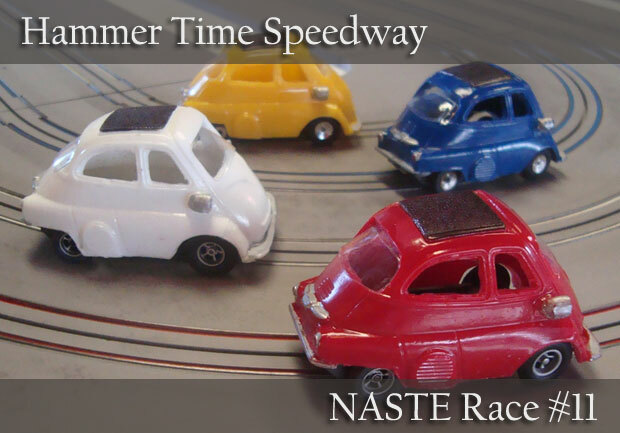 The NASTE point series racing started around the usual NASTE time. 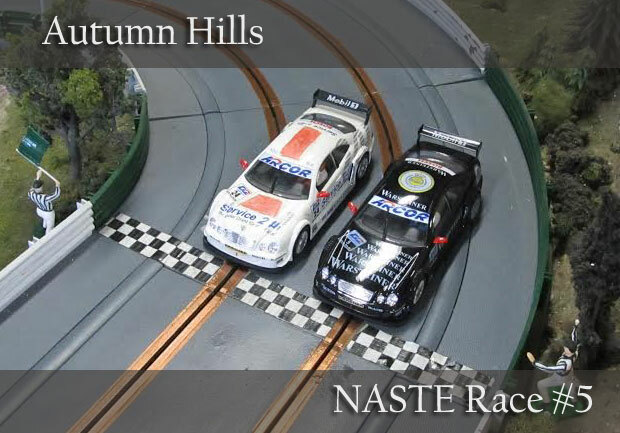 This year we are racing and scoring the NASTE Challenge and expert races separately. First on the track was the first round of Challenge racers. For the first round of racing the racers found themselves in control of 1/32 Revell Monogram Grand Sport Corvettes. The Monogram Grand Sports were in stock configuration with only some rear tire sanding to prepare them for competition. The racing was very close for the Challenge racers as well as the experts. After the first round Mitch Brooks had the lead in the Challenge division and Bill Bostic and Bryan Trachsel were tied for the lead in the expert division. After the wild first round of racing, the experts started the second round. For the second round of racing Carrera 1/24 scale Grand Sport Corvettes were on the grid. Like the Monogram Vettes, the Carrera Grand Sports were in stock configuration with the rear tires sanded, but in addition the traction magnets were removed. The racing in the second round was as wild and close as the first. The highlight of the second round was Todd Flood's impressive win in the Challenge division. A special thanks to Bill Bostic for sponsoring quite the day of racing!